Date: May 8th OUT NOW! Synopsis: Hours after her brother’s military funeral, Honor opens the last letter Finn ever sent. In her grief, she interprets his note as a final request and spontaneously decides to go to California to fulfill it. Review: I wasn't sure what to expect when I picked up this book. All I knew was that the summary lured me in; it had the feel of realistic fiction that I crave and an emotional vibe, so I grabbed a few tissues before I began reading! First off, let me just say that if Kleenex tissues and Simon & Schuster came together and did a little marketing pairing I think they could really make something work!! Because wow-- yes, I am an emotional reader but I have never opened a book where the very first paragraph had my eyes blurred with tears. And that didn't stop until about halfway through the entire book! And of course started up again later on. Okay enough with the crying... let's get to how wonderful this book really is. Author Jessi Kirby writes about a young girl who sets off to fulfill her brother's wishes; he had left her in a letter he sent that arrived to her- several days after his funeral. Finn sends Honor two tickets to see a Kyra Kelley concert on the coast of California and asks Honor to tell her all him. To Honor, the idea seemed silly but this was her recently deceased brother and the only way she knew how to deal with his loss... to accompany her on the trip was her brother's not so welcomed friend Rusty. Honor and Rusty set out on a journey to Texas to California; they both struggling with the loss of Finn- a brother and a friend. Along the way the trip leads them to more than just overcoming their grief-- because lets face it, there are many stages of grief of and every person goes through them at a different pace. Along the way they start to find each other and within that they began to find themselves. Reality is an easy thing to oversee when it's clouded with grief. A beautiful setting and the writing just blew me away. I could almost taste the desert air. This was my first Jessi Kirby Novel, but I'll be sure to read Moonglass now because I loved how her writing had a graceful flow that stayed consistent- with minor subtleties of life's ups and downs throughout the storyline. 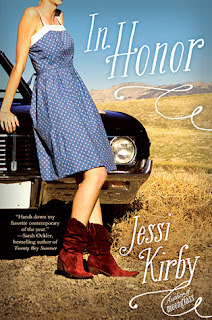 I belief the reason I truly adored this book is because Jessi makes a simple plot and with adorable characters that you want to love right away; well, Honor and Finn at least. Rusty will grow on you! And because death is a familar topic- whether it is personal or someone you know- we all have an experience that is associated with loss; and so we already have a connection with Honor and feel as though as a reader we are on this road trip with her! Every obstacle, every leap, every success, and every emotional breakthrough that Honor goes through... I was there right along with her; In Honor captures a readers heart. And although I started to believe that this book wasn't going to end the way I had imagined it would... it didn't actually; it was even better!! I know that I am being very general about this book... but I'm doing that on purpose; I found this book exciting because I didn't know the outcome and it was emotional because I liked to see where Honor's thoughts would eventually take her. So I hope you'll trust me when I say that this is a MUST READ. haha love the idea of a publisher and kleenex getting together for marketing!! I really cant wait to get hold of this book, it sounds even more amazing now I've read this review! Great review! This sounds like a cute book, and I will definitely read it. I need a break from all of the dystopian settings and this sounds perfect. Thanks for the recommendation!